It was a big pleasure for me to call you this morning about above automatic coiler machine matter. of CD pipe and FEP and COD pipe. so I found your company name and information through on line. 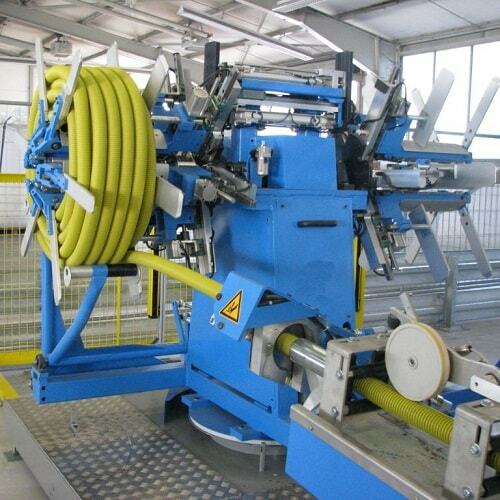 Automatic Double Reel Coiler for winding & scraping ( 6 times )? Currently we are shrink wrapping by hand and takes 2 guys up to ¼ hour per harrow. please note – they are quite lumpy and there are spikes, sharp pieces, etc. And also see the wooden crates for the weed wipers which are approx 600mm square it would be good to wrap these as well. The main object is to give strength, protect and to make it easy to pick up with a forklift. We are open to your suggestions but think a semi-automatic style would be more suited for us so can control thickness eg on ends etc?